Thermal imaging rifle scopes have been used with great effectiveness in military and tactical situations, and these scopes have also proven to be an advantageous asset for hunters, especially when hunting boar. The following guide will go over everything you need to know to purchase a thermal scope on the civilian market. Thermal imaging is a lucrative tool for hunters because it allows the observer to not just see their target in the dark of night, but to actually witness the ambient heat that targets give off at any moment in time. This ambient heat can be fluorescently colored or simply display as a brighter animal-shaped figure on a dark background. In any situation, this technology makes hunting live prey exceptionally easier. Detailed below is a variety of our top thermal imaging scope recommendations. Each of these quality scopes provide a diverse set of features to fit a variety of needs, depending on what is most important when making your purchase. ATN’s ThOR series of thermal hunting rifle scopes has made a firm reputation for its reliability, strong features, and overall versatility. The ATN ThOR HD 640 lives up to the great reputation that the ThOR line brings to bear. 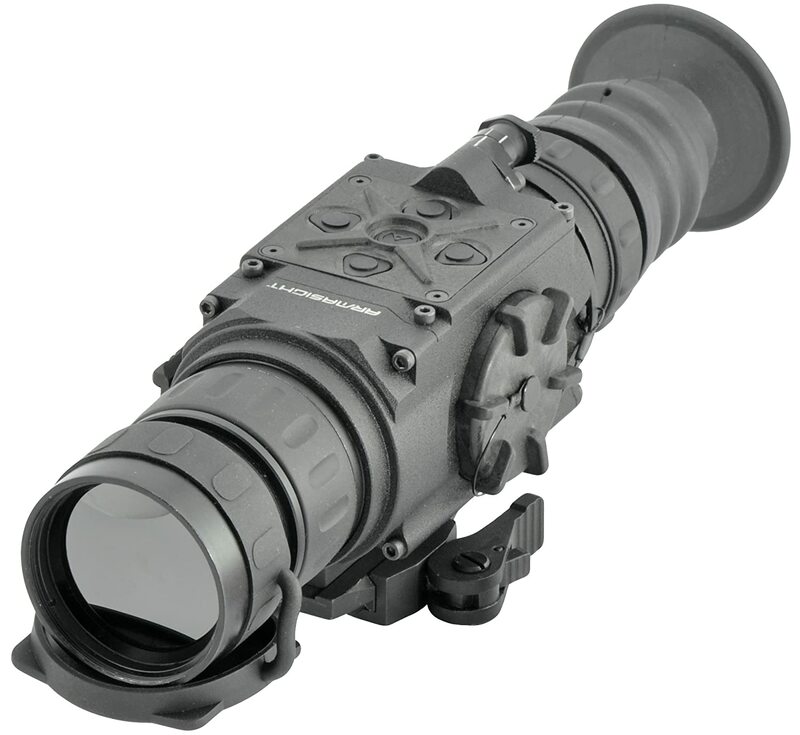 As this is a thermal scope that is rated for combat, ATN utilizes mil-spec germanium ballistic lenses for the eyepieces on this unit. This model is also very lightweight and fits well within the palm while weighing only two pounds. This scope also has a plethora of menu options available by simply operating the directional pad positioned directly on the body of the scope itself. Some of the options that are included are the ability to change the color of the reticle, adjust the display’s brightness level, a full-color overlay mode that features rich tones that vary depending on the environment, and in the menus you can also adjust the reticle type. This device also starts up very fast; it takes less than three seconds from power up to sighting. Also, you can expect twenty-two hours of continuous use from the 20000mAh battery pack. 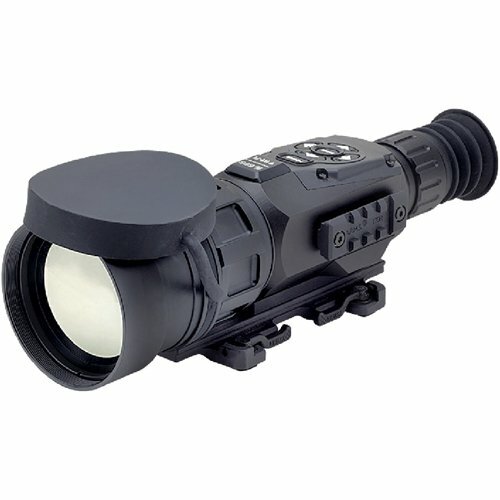 This scope also has great range; its full 5X optical zoom is essential when you need to visually get closer to a target. Since the ThOR 640 has no springs or screws and utilizes a fully digital system to hold zero, the ThOR will never let the reticle move off of base. ATN has also included video-out connectivity so that you can capture your thermal imaging excursions on video. With a thick set of features, great levels of image quality, resolution, and additional functions, the ATN ThOR HD 640 is one of the most versatile thermal rifle scopes on the market, and the winner of our best overall pick. Click here to check the current price. You don’t always need to break the bank to get a quality thermal scope. The Armasight Predator 336 2-8×25 (30 Hz) Thermal Imaging Weapon Sight provides some great, rich features that all come in at a very low price tag. Very light and portable, this thermal scope measures in at 3 x 7.6 x 3.2 x 2.8 inches and weighs only 1.4 pounds. The Predator utilizes solid state, un-cooled, long-wave infrared magnification technology to provide a reliable experience not just to the sportsman, but to law enforcement and military users as well. The targeting display is of a LED type and can display a resolution of 640 x 480. This is a great resolution, so the images are crisp and detailed. This FLIR detector utilizing thermal scope has several features that make it one of the most competitive on the market. The Predator makes use of a drop down menu system to help users navigate through the thermal scope’s features. This ensures that the user experience is both intuitive and simple. This software is upgradeable and allows you to pick from six digitally controlled reticle patterns, access the thermal scope’s recording feature, access the digital E-zoom (up to 4x magnification), and adjust the contrast of the image. Overlay color modes include, white hot, black hot, and rainbow. In addition to the digital E-zoom, this scope also has a optical 1.6x zoom for resolution loss-free sighted magnification. For the recording feature, there is a SD card slot where you can save your hunting videos for later viewing through the TV-out functionality. This sight is a great option with a rich feature-set and costs less than $3,000. It provides well-rounded design and customizability without breaking the bank. Click here to check the current price. Our best thermal scope for under the $5,000 is another in the Armasight line of products, which is their Zeus 336 3-12×42. This scope employs a mid-sized 42mm lens to provide great resolution and vivid thermally enhanced images to the user. Its most noteworthy features include build quality, great drop down menu, and the inclusion of the exceptional FLIR TAU 2 un-cooled micro-bolometer thermal imaging system. This is one durable scope. The Armasight Zeus is comprised of aircraft quality aluminum that can take several tumbles without compromising the chassis of this quality scope. Despite this sturdy construction, this scope is still almost feather light and compact. Measuring in at 10 x 3.2 x 2.8 inches and 1.5 pounds this scope will add minimal weight to your weapon, and will fit comfortably in your hands. As mentioned previously, Armasight created this scope to be 42mm; this is quite larger than the industry standard 35mm. 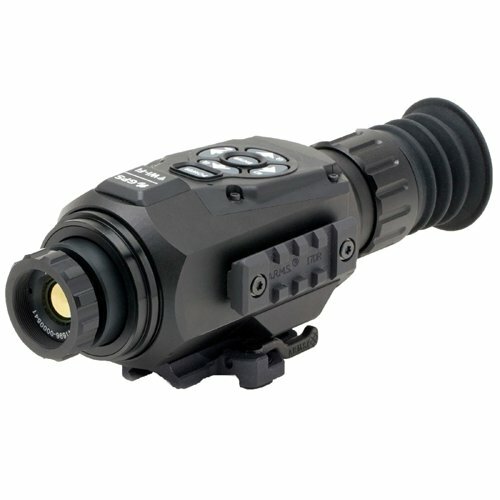 This extra size ensures that the thermal imaging that this scope creates has larger pixels and is thus more detailed. The screen is a color organic LED screen that has a resolution of 800 x 600 pixels. From a features perspective, this scope has more than enough. The keypad for the menu is durable and blends in very well with the body of the scope. The drop-down itself has features that allow you to access the six different reticle types, reticle patterns, color, polarity, and overlay colorization. The E-zoom feature allows you to utilize the digital zooming system without losing as much of the details as typical digital magnification systems. A really neat feature available in the drop-down is the ‘scenarios’ selection. This lets you cycle through high-value target, hog hunting, coyote hunting, deer hunting, bear hunting, mountain lion hunting, and elk hunting scenarios. Click here to see the current price. When utilizing a thermal scope for clearing varmints or hunting for game, you’ll find no better scope than the Flir ThermoSight RS64 2-16X. Hunting takes patience and a scope primarily used for hunting needs to have measured versatility for all of the types of hunting usage that it will encounter and the RS64 doesn’t disappoint in this regard. This scope is around two pounds, and while that adds a little heft to your weapon, that’s not necessarily a bad thing. This unit comes packaged with an active matrix LCD display that displays a resolution of 640 x 480 and is capable of providing 16x magnification. The focal length of the lens is 60mm. While the included internal lithium-ion battery pack guarantees more than four hours of life, it’s the fact that this pack is rechargeable through a USB connection that makes this scope great for hunting. You don’t have to replace your pack at all if you keep the cable wired into a local power source, so there’s no need to necessarily enter standby mode. Insofar as internal features, the RS64 has a simplified scope interface that utilizes a four-button control system. You can access batter charge info from the display, adjust the reticle colors from white, black, red, or green, choose between three distinct reticle types, adjust the color palettes, or establish the included E-zoom magnification. When using the digitally-based E-zoom the targeted object’s resolution is automatically corrected for the extended zoom which helps for high magnification shots. Finally, like many of the scopes present on our list, this thermal imaging scope has video out capability, so that you can keep a record of your hunts. Click here to see current price. As the AR-15 is a great precision rifle, utilizing a thermal scope that is designed to give as much precision at the potential higher moving speeds that you might need to hunt active, larger game is just what the doctor ordered. With its 640 x 480 high-resolution sensor, the ATN ThOR 640 5-50x is exactly what you need. Simply put, this ATN ThOR scope has built-in technology called the Smart Shooting Solution that allows you to forgo hassling with charts, reticles, and calculators to acquire your perfect shot. After you range in on your target and enter wind readings, your scope will adjust your point of impact as necessary for you. Furthermore, the scope’s Recoil Activated Video feature records a video that starts right before you take a shot, the moment itself, and whatever amount of footage you would like to have after the shot is taken; you don’t have to worry about forgetting to record the perfect kill shot or losing your target when trying to mess with video recording. Overall, the HD imaging provides a crisp and beautiful video recording experience to perfectly capture the best moments of your excursions. This compact instrument weighs just a little more than typical ThOR scopes at about 2.75 pounds, and it is 10.67″ x 3.97″ x 3.47″ in dimension. On board are a bevy of features that make this scope perfect for utilization with an AR-15, including a built-in smooth zoom feature with the ability to reach 50x magnification. The scope’s built-in E-Compass and weather resistance make this the ideal tool to have on long hunting trips in a variety of conditions and locations, and you can record where your excursions lead you using the geotagging capabilities. If you plan to use this scope for more than one rifle due to its vast number of technologically advanced capabilities, you can make use of the scope’s profile manager to customize a series of settings specific to each of your rifles. Only 4 AA lithium batteries are required to operate the scope, and it comes with a 3-year warranty. Click here to see the current price. In operation for two decades, ATN has made its specialty the creation of quality night vision and thermal imaging scopes. According to their site, “Our R&D Department has consistently allowed us to launch cutting edge and innovative products and technologies. The new Thermal Line ThOR Series Weapon Scopes, launched in 2011, have been universally recognized as the best line of Thermal Scopes on the market today.” Check out all the ATN products here. Armasight creates quality thermal imaging scopes for a myriad of sectors. Their mission statement encompasses their desire to provide functional, versatile thermal imaging: “The primary goal of Armasight is to create a meaningful presence in the night vision and electro-optical arena by supporting elite military units, law enforcement professionals, first responder agencies and commercial consumers worldwide with the highest value price-to-performance goods and services that are delivered on time combined with the best after-sales support in the industry.” Check out all the Armasight products here. FLIR took its name from the detector system that is most vital to thermal imaging and is responsible for many of the thermal technology that is used today. FLIR is also one of the oldest producers of scopes and thermal imaging technologies. From their site, “An industry pioneer for over 60 years, FLIR is the most vertically-integrated thermal imaging company in the world. We control the technology that’s key to our products’ thermal performance. In producing the R-Series, we leveraged our vast experience designing military-grade thermal imagers that have to be durable, precise, and reliable. The top shots around the world depend on FLIR. 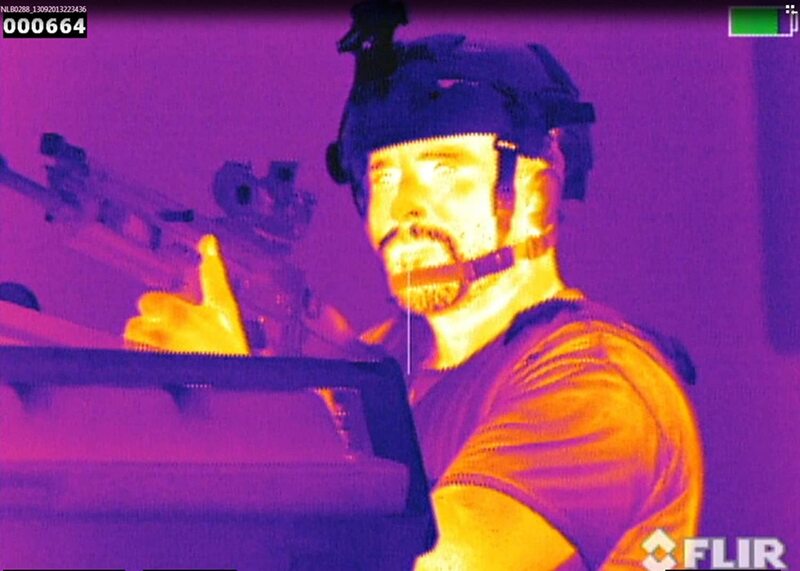 So should you.” Check out all the FLIR products here. Even the un-cooled types of thermal imaging scopes can get expensive. Models go from around $1,500 to more than $8,000. As a rule, the more costly thermal imaging scopes have a richer feature set and greater magnification. When searching for a great scope, try to keep your budget in mind, but also remember that you might not want to sacrifice functionality for a cheaper scope. This is a device that you’ll use for years to come and hopefully it’ll bring you success in use, so be sure to balance your need with your wallet judiciously. Also, thermal imaging technology is becoming more mainstream, so while today’s scopes might seem to be more on the expensive side, prices are sure to come down a bit in the near future. Even today, prices for these types of devices are a fraction of what they were even a few years ago. Like many modern devices, thermal rifle scopes require power to function. Typically, you can use lithium batteries to power your scope and charge will vary greatly based on model. If you can find a thermal imaging scope that lasts around eight hours on a charge, then you’ve found one that lasts fairly well. Just like in today’s graphical processor and television systems, refresh rate has great value in thermal imaging. Most scopes on the market today come in 30 or 60 hertz varieties. Hertz, when it comes to digital images represents cycles per second or how often a presented image is refreshed. The more refreshes the more lifelike the displayed image will appear. As a rule, when it comes to refresh rate, shoot for a thermal imaging rifle scope that has a rate over 30 hertz, this will ensure that if whatever you’re tracking starts to move it won’t appear like a slideshow. Some find that a larger 60 hertz display isn’t really that important as that level of cycles per second won’t make a noticeable difference unless the target is moving at a fairly rapid pace. Others have noted that if trying to target something from a moving platform, such as the bed of a truck, 30 hertz tends to lag too much, so this is a situation where 60 hertz shines. Thermal imaging scopes aren’t like standard mechanical scopes; their image is relayed using technology not unlike what is found in many of our current crop of digital devices. Just like in any other digital display, resolution is the primary means to providing a crisp, reliable image while using a thermal imaging scope. The reasoning for this is simple; too much pixilation distorts the edges of the target which can then cause misses. When it comes to resolution, your best bet is to purchase the highest resolution that fits within your scope budget. Thermal imaging doesn’t always provide as high detail as standard night vision imaging as its power is in detection, so having extra resolution for clearer image finding can really help you out on a hunt. Zoom typically goes hand-in-hand with resolution. There are two types of zoom, optical and digital. As a rule, optical zoom will allow you to magnify in on a target without losing quite as much of its resolution. Digital on the other hand, utilizes software to get closer to the target and zooming too far with this, at least without the help of other tech, will result in a lower resolution image. Thermal scopes with a combination of these types are a great way to get the extended zoom of the digital, with the image quality of the optical. When you’re thinking about making a purchase of a scope, definitely take a look at what the scope has to offer for zoom. The reticle, also known as a crosshair or reticule, helps provide accurate target sighting on a thermal scope. Some scopes feature a fine reticle while others feature one with thicker lines. Some scopes have a wide selection of reticles which you can select and can range from a standard crosshair to a simple central dot. Some manufacturers don’t provide a reticle in their thermal scopes, so be sure to do some research on the scope you intend to buy so that you know what to expect when you use it to target. Glass is a great insulator; and as a result, it isn’t a material that can be used very well in thermal optics. The reason why glass is transparent is because visible short wavelengths pass freely through the material, but since infrared is heat energy and the glass blocks these wavelengths as an insulator, it’s impossible for the infrared detector elements to pick up the thermal information as the glass is blocking its reception. Germanium, a chemical rare element, can be made transparent and allow for the transmission of light on the infrared spectrum so the lenses on thermal imaging scopes tend to be made of this material. One caveat though, germanium is very expensive, especially compared to standard glass. As a matter of fact, a sizeable reason that these scopes costs so much compared to standard scopes is because of this lens material. You can safely assume that the larger the lens, the more you can expect to pay for the rifle scope. When many think of thermal imaging, they think of the bright oranges, reds, and yellows portrayed in the 1987 film Predator. While with the current crop of thermal scopes, you can get a great approximation of this effect, it’s not the only option for thermal imagery. For a little less you can get a monochromatic option that provides a great gradation level when observing an option. For monochrome thermal scopes, warm targets are simply brighter on the grayscale and still stand out very well from their cooler environments. 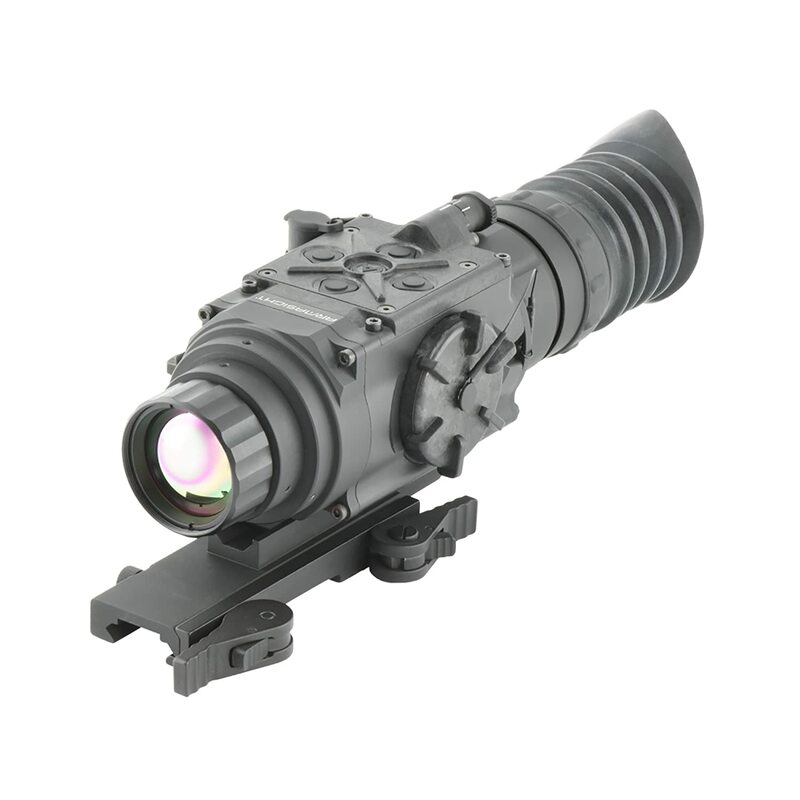 Clip-on – Clip-on sights employ a thermal imager that you attach via rails to your current scope. These work very well, and many of the scopes in this category can be used independently but typically have slightly reduced zoom capability, so they are better when used in conjunction with another scope. Since your standard scope is view finding through the screen of your thermal imaging scope, at high magnifications some loss in resolution can occur. Standard – This is the type that utilizes standard scope technology and works in conjunction with an internal thermal imaging sensor. The images that this type produces provide great heat detail by using a myriad of colors, or it can present the thermogram display in a more monochrome readout. This typically depends on the manufacturer and the imaging system’s components. Some scopes have extra bells and whistles on them like a DVR to record everything that the scope sees. This allows you to take a look at the days hunting after it’s done. Some models even feature an RCA out setup that will allow you to hook a monitor directly to the scope. Another extra feature on some scopes is the addition of a standby mode. Since most scopes incorporate a battery as a power source, this type of feature allows you to save the battery during times when you are relaxing or when the scope is not in active use. Many thermal scopes utilize a menu system that allows you to select your reticle, adjust brightness, or wind and elevation settings. 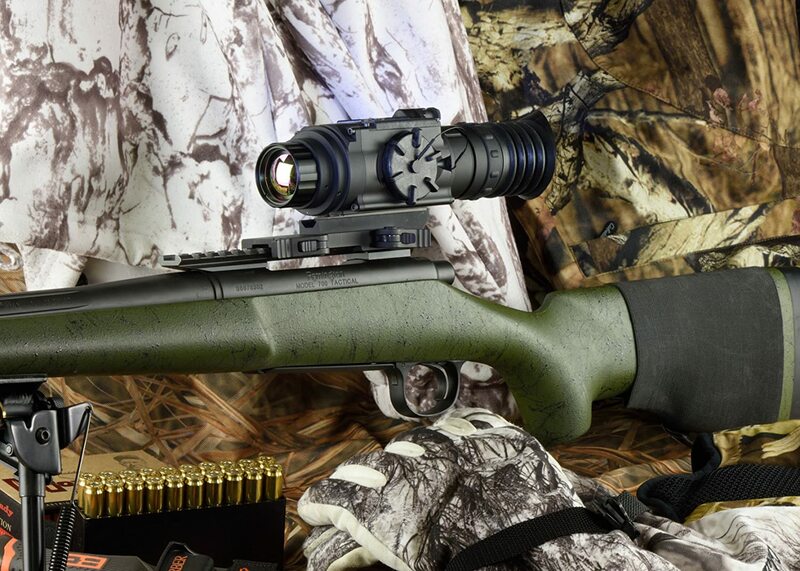 Having extra features can make your thermal scope seem more versatile, which adds value to your purchase. Selecting a great thermal imaging scope is a process that requires a lot of due diligence but is ultimately a very rewarding experience. Take the time to establish a budget, get to know the technology intimately, and learn the feature sets of some of the best units on the market. This guide, hopefully, will help you through the process and help to educate you on some of the features of the tech, the brands available on the market today, and some of the best units for sport shooting and beyond. How does this technology work? Initially developed in the military sector, thermal imaging allows those who utilize it to see the seemingly invisible. As a rule, all animals emit infrared energy as heat during the natural processes of life; it is that thermal energy that is visible to an observer using an thermal imaging scope. Since the majority of objects in the natural world emit heat in one form or another, the majority of scopes capture the differences in heat between the target and its immediate environment. 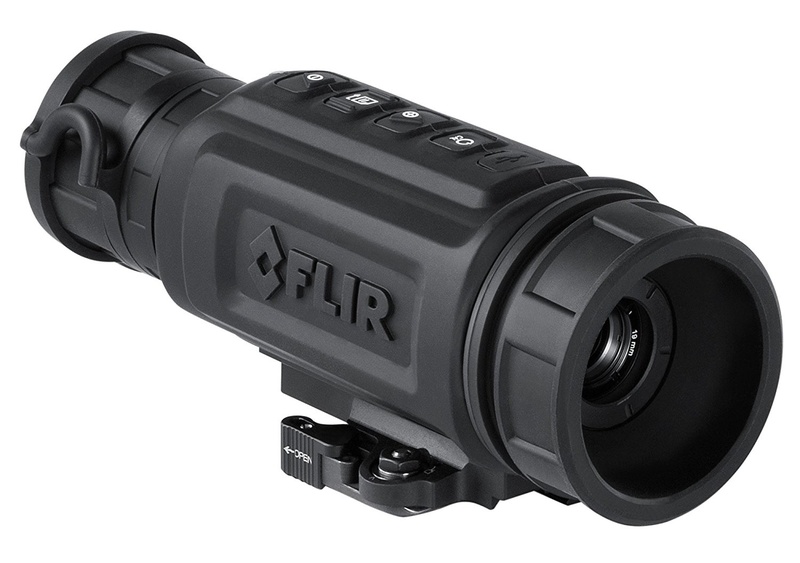 Forward looking infrared (FLIR) systems are the types of infrared detectors that many rifle scopes utilize to pick up infrared light. The lens in the scope focuses all of the incoming infrared light; this light is then scanned by infrared detector elements in the array, and these elements create a thermogram. It only takes about one-thirteenth of a second to create a thermogram, so to the observer it appears to happen in real-time. The thermogram is then processed and projected to the display for the observer to use. The images that are delivered can tell you when a target is under a bush or even hunkered down to avoid a strong rain shower. The majority of external elements such as weather or poor lighting do not decrease the reliability of this type of imaging. Un-cooled thermal imaging – This type of thermal imaging is what the majority of thermal imaging devices utilize. The elements that detect infrared energy operate at standard temperatures; and as a result, they don’t need additional materials to keep the key thermal elements below 32 degrees fahrenheit. Since extra machinery isn’t needed, this system is very quiet, which can be beneficial for hunters. These types of sights provide great temperature differential information but aren’t quite as sensitive as the other type. Cryogenically cooled thermal imaging – This is typically the more expensive option. The system employs internals that are sealed and mechanically cooled to freezing temperatures or below. These types of devices can have a slight hum to them though that is typically only noticeable in close proximity to the assembly. Despite the additional cost, this system provides a great advantage as they have heightened sensitivity compared to un-cooled systems of thermal imaging. These types of scopes can observe very minute temperature differentials from more than 1,000 feet away from the target. The only negative aspect of this type of thermal imager outside of the cost is the fact that with all of the extra components for cooling, this type of device is not quite as rugged as the un-cooled variety. For the most part, the majority of weapon targeting thermal imaging scopes are un-cooled and the weapons scopes that we’ll be covering in this guide are of this type as well. As mentioned before, cryogenically cooled devices offer more temperature detail and this type is perfect for many civilian applications, but as these can get to be very expensive they are mostly limited to thermal imaging cameras.